“I chose to grow flowers in poly house for introducing technology in my village for other farmers to see and adopt. 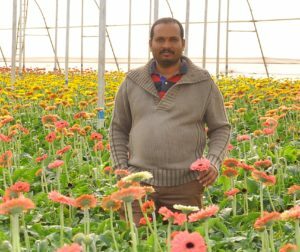 Also growing in poly house is a financially stable venture,” says Mr. Sama Yella Reddy, progressive farmer from Vishwanathapalli village, 18 km from Siddipet city, Telangana. Mr. Reddy holds PGD in Electronic Commerce and MBA in Computers from Barcelona, Europe. After completing his education he worked for 2 years in Hyderabad based company in marketing department and later changed his domain to finance in IT industry. Having worked for more than a decade in Spain, US and Dubai, he came back and turned into a farmer! “I came back to live close to the nature and took up farming to help farmers in my village adopt new technologies and sell their farm produce independently. Also I wanted my village to attain a distinctive name in the floriculture industry,” he describes the drive to become a farmer. 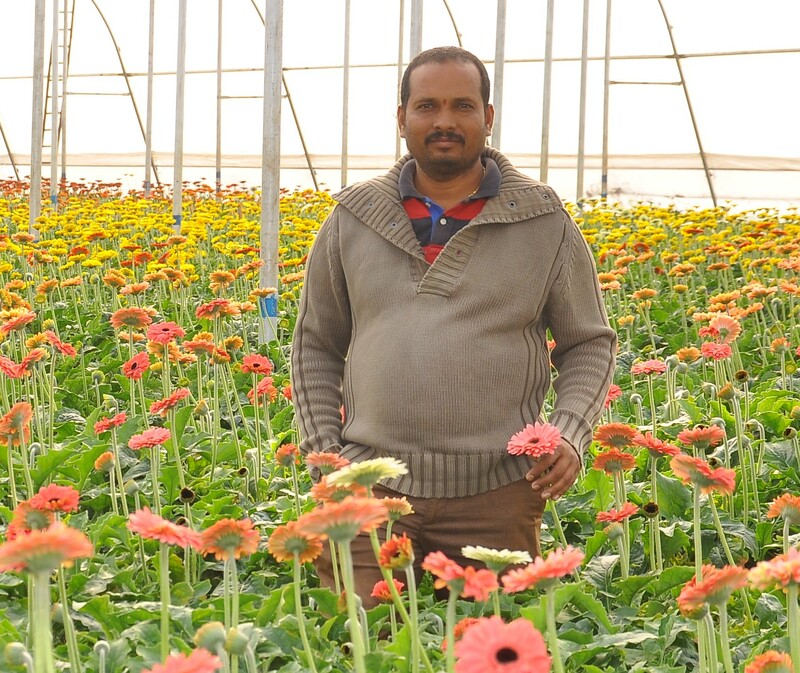 He started growing gerbera in poly house in 2013. The poly house was set up with the capital investment of Rs. 24 lakh in one acre area. It is named as Ahaara Yoga. He got 50% subsidy from the state government. To prepare himself on farming before the financial investment Mr. Reddy visited several farms throughout India specializing in gerbera cultivation and poly house cultivation. He also took one week training at Horticulture Training Centre, Pune. 11,500 tissue culture saplings were sourced from different states at an average the cost of Rs. 33/sapling. Keeping the plant-plant distance as 1 feet and row-row distance 70cms saplings were transplanted in the poly house in two rows in a bed. However, observing the plant as stressed and increased temperature inside the poly house Mr. Reddy decided to quit chemical farming inputs and switch to natural farming practice. “I could see the plants had stress issue, increase in soil borne diseases (bacterial infections, nematodes), high humidity, hardening of soil etc. So I changed the saplings and started fresh with organic farming. Within a year of change in farming practice there was lot of positive changes in the farm. It had been the right decision in every aspect. Usually the lifespan of gerbera plants is 2.5 years later to which it needs to be replaced. However I have been harvesting flowers from past 4.5years from the same plants. 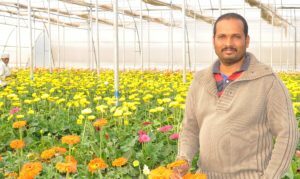 We have six colour varieties of gerbera grown in our farm,” he elucidates. 250 flowers/plant is the annual production rate in poly house cultivation. The plant starts flowering three months from the transplantation date. Flowers bloom till the plants are removed. Mr. Reddy had fairly good production of flowers since establishment in 2013. Conversely the sales were low. Therefore to boost the sales he created a unique marketing strategy, “Normally flowers are sold in Hyderabad. So I diverted all my attention to marketing in the first year itself because I had to bring the buyers to the farm instead of going in search of buyers! I started publicizing my farm and flowers in my city Siddipet. With consistent efforts my farm started having walk-in bulk buyers,” he asserts. In addition he began selling flowers in off-season (winters and rains) in North India where demand of flowers is high during this period. The bug of agripreneur bit Mr. Reddy and he decided to cultivate seasonal vegetables, fruits and paddy in 30 acre open cultivation continuing growing flowers in poly house. He wanted to stick to natural farming practices therefore it was mandatory to have a small dairy unit of indigenous Indian cows within the farm premises. He also started his own organic store named as ‘Ahaara Yoga’. “This year we had good rains so I cultivated paddy variety ‘Telangana Sona- RNR 15048’in 14acres. I am expecting 350 quintals paddy production. It would be sold along with vegetables, A2 milk, pulses, millets and fruits at my own organic store in Siddipet (Ahaara Yoga). Excess produce of paddy will be sold in Hyderabad,” he shares.